First of all we would like to thank you, Dr. Stefan and the OB/GYN team for a great experience when giving birth to our son.Everyone was extremely helpful and courteous and made our stay very enjoyable. We also really appreciated the candle light dinner, the food was delicious!! 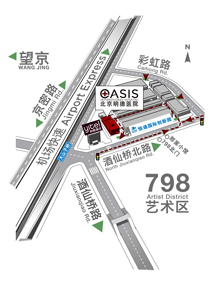 We will sincerely recommend OASIS to all of our friends and family. Lisa & Fabien Gentou . He Rong Zi is our nurse at the TCM clinic. Last year, she was on her holiday traveling to Malaysia when one of the customers on the flight was unconscious and the flight assistant asked for help. As a nurse Ms. He immediately checked the patient's vital signs. No blood pressure could be heard. Ms. He realized it was very dangerous for the patient and she made a quick decision to begin the IV infusion in time. Fortunatly, after 30 minutes of treatment the patient regained consciousness. Days later, we received a thank you letter from the Malaysia Airlines. OASIS International Hospital is so proud of having nurses like her. I'm sure we will give our clients better service in the future.